Note: The first version of this had a bug; I forgot to add the "Gender" filter to the final view, so everything was showing up at about 3 times the actual value. It's fixed now, with a thanks to Tableau Zen Master Allan Walker of Utah State University for catching it. While I was at it, I added a second view to show differences by gender. The last time I wrote about the salaries of educators, I said I'd never do it again: There were too many people who didn't know the difference between nominal and constant dollars ("No one made $75,000 in 1980!") and those who didn't understand averages ("How could the average in that state be $60,000? I only make $53,000!"). But this is interesting, I think in light of discussions about the rapid increase in tuition over time (in case you've been under a rock recently.) 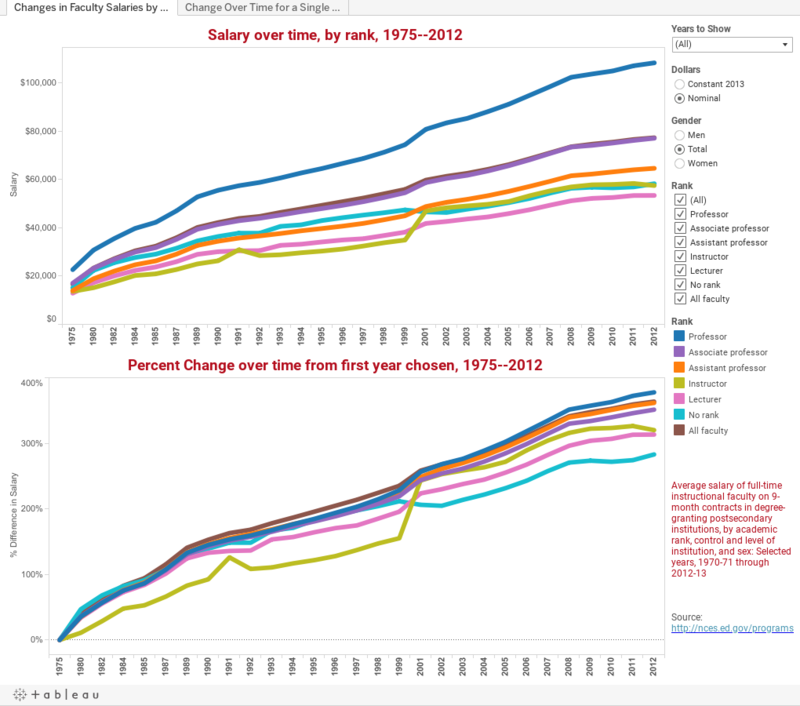 It shows the changes in average (there's that word again) faculty salaries by rank since 1975, in either nominal or constant (inflation adjusted) dollars.